Perfect for college students who want a healthy lifestyle but don’t have much time or money, this vegetarian cookbook is full of 300 quick, easy, and budget-friendly recipes, along with tips and a glossary of cooking terms for a beginner chef. Finding time to eat a healthy meal can be difficult for any college student, but for those following a vegetarian diet, the limited fare in campus dining halls can make it nearly impossible. The Quick and Easy Vegetarian College Cookbook can help you create delicious and healthy vegetarian recipes that cost less than takeout and are ready before a deliveryman could arrive. In this cookbook, you will find 300 recipes that range from healthy breakfasts to study-session snacks perfect for all-nighters—without the need for a fully equipped kitchen. With the help of a glossary of cooking terms and checklists of essential kitchen and pantry staples, novice chefs can whip up new favorites like Scrambled Egg Burritos, Quick Pasta Pesto, and Mini Goat Cheese Pizza in no time! 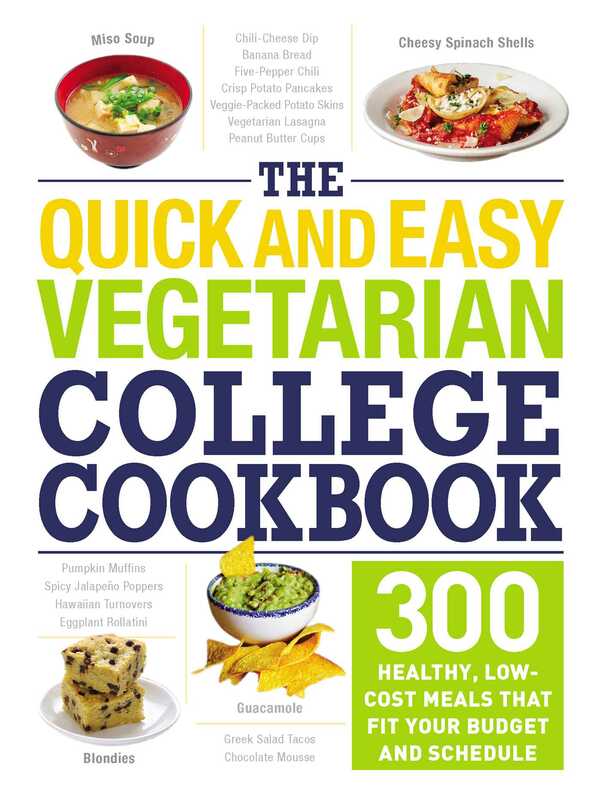 "Healthy, low-cost food options that are dorm-room friendly have been traditionally hard to come by, but The Quick and Easy Vegetarian College Cookbook from Adams Media offers more than 300 meals that fit the bill. Staying healthy amid the hustle and bustle of college life can be tough, but this recipe book offers delicious meals and snacks for even the busiest students. Simple-but-wholesome recipes ... keep both costs and time constraints in mind. Vegetarians and omnivores alike are sure to have fun exploring this delicious new cookbook." "I really appreciated the no-nonsense approach of this cookbook that offers simple, easy, quick recipes to make eating healthy a viable option while away at school. Spanning breakfast to dinner and soups to snacks, many of the recipes in this comprehensive collection can even be made without a fully-equipped kitchen. Of course, it’s not JUST for college students, it has a mix of vegetarian and vegan recipes that appeal to anyone on a budget."